What a year it was for Canadian golf. Our pros won literally around the world and on just about every tour imaginable. Our amateurs of all ages made Canada proud at home and abroad. And, off the course, there were significant moments that are well worth memorializing as 2019 looms on the horizon. Brooke Henderson repeats as Canadian Female Athlete of the Year for both Canadian Press and Postmedia. Jaclyn Lee opts to forego her final semester at Ohio State University to turn professional. The 21-year-old from Calgary, a six-year member of the Team Canada program, earned her LPGA Tour card in November after finishing sixth at the Q-Series LPGA tournament. Brian McDonald, the director of golf and general manager of Fairview Mountain in Oliver, B.C., fires five birdies in the final round to claim the PGA Head Professional Championship of Canada Presented by Titleist & FootJoy. Three of four Canadians improve their Web.com Tour status at the Tour’s Qualifying event. They were led by Brad Fritsch of Manotick, Ont., who posted a 10-under 62 in the final round. His T-8 finish earned him 12 guaranteed starts in 2019. Michael Giglic of Burlington, Ont., and Toronto’s Albin Choi ended up inside the top 40, getting eight starts. Vancouver’s Seann Harlingten maintained his conditional status. Team Canada, Adam Hadwin and Nick Taylor, tie for fourth at the World Cup of Golf in Australia, the best finish by Canada since Dave Barr and Dan Halldorson won the event in 1985. After setting a course record of 61 in the second round, Calgary’s Stephen Ames ends up T-5 at the PGA Champions Tour finale, the Charles Schwab Cup. 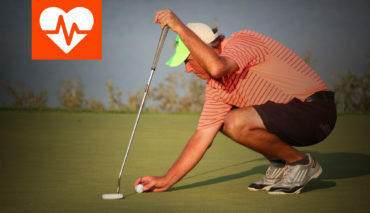 It ended a great year for the 54-year-old Ames, who finished with four top-10s for the season. Calgary’s Jaclyn Lee and Anne-Catherine Tanguay of Quebec City earn LPGA Tour status for 2019 in the final stage of Q-school. Lee finished sixth while Tanguay was T-8. Corey Conners of Listowel, Ont., is out-duelled by PGA TOUR freshman phenom Cameron Champ in the final round of the Sanderson Farms Championship to finish runner-up. Champ rode a hot putter to birdie five of the last six holes to deny Conners the title. Team Canada member Hugo Bernard of Mont-Saint-Hilaire, Que., winner of the 2016 Canadian Men’s Amateur, turns pro. Team Canada standout Maddie Szeryk, a resident of London, Ont. also turned pro after a stellar collegiate career at Texas A&M. A record eight Canadian men will be in the field for the 2019 PGA TOUR season: David Hearn, Nick Taylor, Adam Hadwin, Corey Conners, Mackenzie Hughes, Adam Svensson, Roger Sloan and Ben Silverman. Ben Silverman of Thornhill, Ont., Adam Svensson of Surrey, B.C., and Roger Sloan of Merritt, B.C., secure their PGA TOUR cards for 2019 due to their performance on the Web.com Tour. Mr. 59! Drew Nesbitt of Toronto has four eagles, including a hole in one, five birdies, eight pars and a bogey to post the first 59 in PGA TOUR Latinoamerica history in the second round of the Brazil Open. Marc-Etienne Bussieres of Longchamp, Que., defends his title at the PGA Assistants Championship of Canada Presented by Callaway Golf. Richard Yung, a former Team Canada member, drains a 40-foot birdie putt to win the Suzhou Open, a PGA TOUR Series-China tournament. 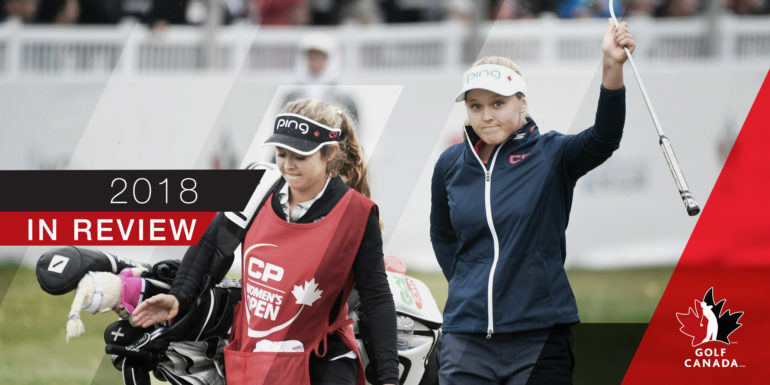 Brooke Henderson becomes the first woman in 45 years to win the CP Women’s Open. At 20, the Team Canada graduate claimed her seventh LPGA Tour victory, including a major, but none was greater than this at Regina’s Wascana Country Club. Jocelyne Bourassa won the event in 1973. Peter Campbell of Nova Scotia wins his first pro title, the Beijing Championship, on the PGA TOUR Series-China. The world’s top-ranked men’s golfer, American Dustin Johnson, wins the RBC Canadian Open at Glen Abbey Golf Club in Oakville, Ont. Mackenzie Hughes of Dundas, Ont., is the top Canadian, tying for eighth. Team Canada member Chris Crisologo finished T45 to earn low-amateur honours. American Jessica Porvasnik wins the DCM PGA Women’s Championship of Canada at the Ladies’ Golf Club of Toronto. Pierre-Alexander Bedard of Club de golf Cap Rouge wins the PGA Championship of Canada presented by TaylorMade and adidas Golf at Credit Valley G&CC. Brooke Henderson wins her sixth LPGA Tour title, the Lotte Championship in Hawaii. Graham DeLaet of Weyburn, Sask., was elected to the Boise State Hall of Fame. Along with his success at the collegiate level and on the PGA TOUR, DeLaet competed for Canada at the Olympics, the Presidents Cup and the World Cup. Adam Svensson of Surrey, B.C., wins his first Web.com title, The Bahamas Great Abaco Classic. Joey Savoie of La Prairie, Que. and Maddie Szeryk a London, Ont., resident, are recognized as Canada’s top male and female amateur golfers for 2018 based on the final standings of Golf Canada’s National Orders of Merit. It was Szeryk’s fourth consecutive year topping the Women’s Amateur Order of Merit. On the junior side, Céleste Dao of Notre-Dame-de-l’Île-Perrot, Que. and Matthew Anderson of Mississauga, Ont., took home top honours on the Future Links, driven by Acura National Junior Order Merit. Nine Canadians were named to the 2018 Global Golf Post All-Amateur teams: Garrett Rank (Elmira, Ont. ), Second Team, Men’s Mid-Amateur; Jaclyn Lee (Calgary, Alta. ), Honourable Mention, Women’s Amateur; and Julia Hodgson (Unionville, Ont. ), First Team Women’s Mid-Amateur. In the Women’s Senior category, Mary-Ann Hayward (St. Thomas, Ont. ), Judith Kryinis (Thornhill, Ont. ), Jackie Little (Proctor, B.C.) and Terrill Samuel (Etobicoke, Ont.) were named to the first team while Allison Murdoch (Victoria, B.C.) was a second-team selection and Marie-Therese Torti (Candiac, Que.) received honourable mention. 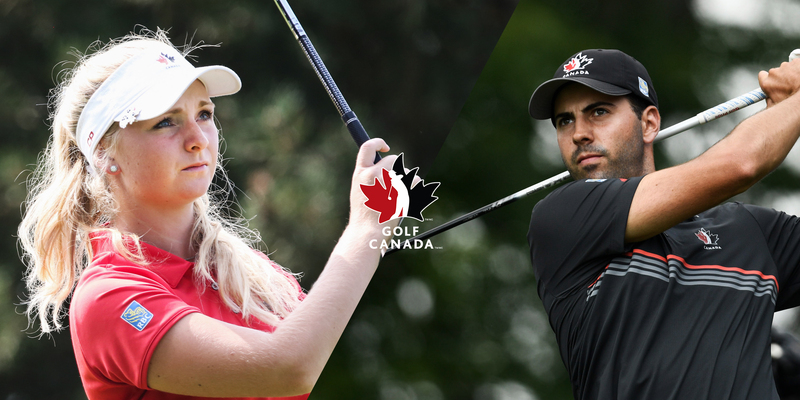 Golf Canada announced the 17 athletes who will represent Team Canada as part of the 2019 National Amateur and Junior Squads. Women’s National Amateur Squad: Jaclyn Lee, Calgary; Naomi Ko, Victoria; Brigitte Thibault, Rosemere, Que. Men’s National Amateur Squad: Joey Savoie, La Prairie, Que. ; Chris Crisologo, Richmond, B.C. ; Josh Whalen, Napanee, Ont. ; Brendan MacDougall, Calgary. Women’s Junior Squad: Celeste Dao, Notre-Dame-de-I’lle-Perrot, Que. ; Ellie Szeryk, Allen, Texas; Emily Zhu, Richmond Hill, Ont. ; Sarah Beqaj, Toronto; Monet Chun, Richmond Hill, Ont. Men’s Junior Squad : Laurent Desmarchais, Longueuil, Que. ; Christopher Vandette, Beaconsfield, Que. ; Jeevan Sihota, Victoria; Olivier Menard, Salaberry-de-Valleyfield, Que. ; Kai Iguchi, Banff, Alta. The Red Deer College Queens win the women’s Canadian Collegiate Athletic Association (CCAA) national championship while Cegep Andre-Laurendeau claims the men’s title. Celeste Dao, 17, of Notre-Dame-de-l’Île-Perrot, Que. and William Duquette, 17, of Laval, Que. represented Team Canada in golf at the Youth Olympic Games in Buenos Ares, Argentina from October 6-18, 2018. Dao finished T13 and Duquette 28th in their respective divisions. The duo also combined to finish 22nd in the mixed team competition. Jennifer Gu of West Vancouver, B.C., and Ilirian Zalli of Burnaby, B.C., claim their respective titles at the Future Links Presented by Acura Fall Series in B.C. Team Canada Development Squad member Chris Vandette, the reigning Canadian Junior Boys champion, wins the Duke of York Young Champions at Castle Stuart Golf Links in Scotland. Jaclyn Lee of Calgary, a senior at Ohio State University, claims her fourth NCAA golf title at the East & West Match Play in Michigan. American Brady Exber wins the Canadian Men’s Senior Championship at New Brunswick’s Gowan Brae Golf and Country Club, edging Peter Detemple, a native of Vancouver. British Columbia claims the team title. Ottawa’s Camelot Golf & Country Club plays host to the World Junior Girls Golf Championship, and among the 18 countries represented, Team Italy beat Team USA in a playoff to win the team title. Team Canada One, comprised of Céleste Dao (Notre-Dame-de-l’Île-Perrot, Qué. ), Ellie Szeryk (London, Ont.) and Tiffany Kong (Vancouver, B.C.) finished fourth in the team competition while Canada Two consisting of Emily Zhu (Richmond Hill, Ont. ), Sarah Beqaj (Toronto, Ont.) and Lauren Kim (Surrey, B.C.) finished 18th. Australian Sue Wooster successfully defends her Senior and Mid-Master titles at the Canadian Women’s Mid-Amateur and Senior Championship at Lookout Point Country Club in Fonthill, Ont., edging Mary Ann Hayward of St. Thomas, Ont., by one shot. Hailey McLaughlin of Markham, Ont., and Yuqui Liu of Thornhill, Ont., win their respective divisions at the Future Links, driven by Acura Fall Series Championship at Owl’s Head Golf Club in Masonville, Que. Kentucky’s Joseph Deraney shoots 65 to win the Canadian Men’s Mid-Amateur at B.C.’s Victoria Golf Club. Two-time Mid-Am champ Kevin Carrigan of Victoria finished second. Céleste Dao of Notre Dame de I’Ile Perot, Que., a member of the Team Canada Development Squad, wins the Canadian Junior Girls Championship in Tsawwassen, B.C. Christopher Vandette of Beaconsfield, Que., becomes only the 10th player since the joint event was established in 1948 to win both the Canadian Junior Boys and Juvenile Boys Championships. American Yealimi Noh, 17, wins the Canadian Women’s Amateur at Vancouver’s Marine Drive Golf Club. The teen standout earned an exemption into the CP Women’s Open in Regina where she claimed low amateur honours. Future Links, driven by Acura Junior Skills Challenge National Event at Glen Abbey announces the national champions: Andre Zhu, King City, Ont., Boys 9-11; Lindsay McGrath, Milton, Ont., Girls 9-11; Matis Lessard, Quebec City, Boys 12-15; Alissa Xu, King City, Ont., Girls 12-15; Gregoire Vincent, Quebec City, Boys 15-18; Taylor Cormier, Corner Brook, NL, Girls 15-18. Owen Mullen of Truro, N.S., and Haley Baker of Mississauga, Ont., claim their respective divisions in the Future Links, driven by Acura Atlantic Championship at Twin Rivers Golf Course in Newfoundland. Wesley Hoydalo of Selkirk, Sask., and Sydney Scraba of Calgary win their respective divisions at the Future Links, driven by Acura Prairie Championship at Portage GC in Manitoba. Robbie Latter of Mississauga, Ont., and Emily Romancew of Pierrefonds, Que., win their respective divisions in the Future Links, driven by Acura Quebec Championship at Club de golf Lachute in Quebec. The University of British Columbia Thunderbirds win their third straight women’s title in the Canadian University/College Championship. The host University of the Fraser Valley Cascades win the men’s title. Laurent Desmarchais of Longueuil, Que., and Taylor Kehoe of Strathroy, Ont., win their respective divisions at the Future Links, driven by Acura Ontario Championship at Otter Creek GC. Monet Chun of Richmond Hill, Ont., and Cole Wilson of Kelowna, B.C., win their respective divisions in the Future Links, driven by Acura Pacific Championship at Bear Mountain Golf Resort in B.C. Team Canada member Celeste Dao comes from six back to win the Mexican Junior Girls Championship in a three-hole playoff. Calgary’s Jaclyn Lee, a junior at Ohio State, ties a 54-hole scoring record en route to winning the Big 10 Championship. It was her third NCAA title of the year. Team Canada member Maddie Szeryk, a senior at Texas A&M, wins her second straight NCAA tournament, the Dale McNamara Invitational in Oklahoma. Toronto’s Vanessa Borovilos wins the girls’ 10-11 age division in the Drive, Chip & Putt Finals at Augusta National. Jaclyn Lee of Calgary breaks an Ohio State school record with a 64 in the final round to win her second NCAA title, the Westbrook Spring Invite in Arizona. National Amateur Squad member Chris Crisologo of Richmond, B.C., wins the South American Amateur in Argentina. The RBC Canadian Open was honoured at the PGA TOUR’s Tournament Meetings for its “Best in Class Element”, thanks to the success of its fan experience, The Rink. For the past two years, the par-3 seventh hole at Glen Abbey Golf Club was transformed into a rendition of a hockey rink, complete with boards lining the hole, upgraded bleachers and viewing decks, with marshals dressed as referees. A net, puck and hockey sticks were available for the pros to test their hockey skills as part of Wednesday’s Championship Pro-Am. Golf Fore the Cure Presented by Subaru announced it raised more than $425,000 for breast cancer research in 2018, thanks to the efforts of more than 13,000 participants at 175 events across Canada. Since the program’s inception in 2003, upwards of 120,000 women have raised more than $6.7 million with all proceeds donated to the Canadian Cancer Society and the Quebec Breast Cancer Foundation. Golf Ontario and the Northern Golf Association announce a partnership to grow the game in that province. As a result, all NGA members will also be Golf Ontario members, both associations will continue to invest in initiatives such as Golf in Schools, and there will be a stronger collaboration in areas such as course rating, handicapping and competitions. The sole Canadian stop on the PGA TOUR Champions Tour, Calgary’s Shaw Charity Classic, announces it had donated a record-breaking $12.4-million donation to be shared among 182 youth-based charities in Alberta. That brought the six-year total to more than $34 million since the event’s inception, impacting more than 500,000 youth in the areas of sports, arts, health, development and counseling. Brittany Henderson of Smiths Falls, Ont., is inducted into her alma mater’s Athletics Hall of Fame at Coastal Carolina University. Prior to putting her playing career aside to caddie for sister Brooke, Brittany was a member of Team Canada and an outstanding collegiate golfer, leading her school to two Big South Championships. The R&A announces that the 2019 RBC Canadian Open will be one of 16 events that will make up the Open Qualifying Series. Longtime Golf Ontario Executive Director Dave Mills is honoured with the International Association of Golf Administrators Distinguished Service Award. Team Canada Junior Women’s Coach Matt Wilson of Newmarket, Ont., is named Coach of the Year for the PGA of Canada Ontario Zone. Former LPGA Tour player Christa Teno of Tecumseh, Ont., is named Coach of the Year by the LPGA Teaching and Club Professional association. She has been the head women’s coach at Florida’s Seminole State University since 2007 and coached the team to a national championship in 2015. Tina Tombs, a native of Montreal who played on the LPGA Tour and now resides in Arizona, is named Teacher of the Year. Brooke Henderson of Smiths Falls, Ont., is named female summer athlete of the year at the Canadian Sports Awards. She would later be voted a runner-up finalist for the 2018 Lou Marsh Award. The Canadian Golf Superintendents Association names Dean Baker of Ontario’s Burlington Golf and Country Club as superintendent of the year. The PGA TOUR announces that Osprey Valley, a 54-hole facility north of Toronto, will become the first member of the TPC Network in Canada. In July, Osprey Valley hosted the inaugural Osprey Valley Open, an official Mackenzie Tour-PGA TOUR Canada event. Bryan Crawford of Ancaster, Ont., is named Tournament Director of the RBC Canadian Open. Earlier in the year that Ryan Paul of Oakville, Ont. was named Tournament Director for the CP Women’s Open. Canadian Pacific announces it has extended its title sponsorship of the CP Women’s Open for five years, from 2019 through 2023. Golf Canada and CP also announced that the 2019 CP Women’s Open would be hosted at Magna Golf Club in Aurora, Ont. RBC, Golf Canada and the PGA TOUR announce that the 2019 RBC Canadian Open will move to a premier date on the TOUR schedule, one week before the U.S. Open. The 110th RBC Canadian Open will be played at Hamilton Golf & Country Club from June 3 to 9. Longtime golf journalist Mario Brisebois is named for induction into the Quebec Golf Hall of Fame. Congratulations as well to the many deserving individuals across Canada inducted into their respective Provincial Golf Hall of Fame in 2018. Revered Canadian pro Jerry Anderson passes away suddenly at the age of 62. A totally revised Rules of Golf is revealed for review, to be implemented on January 1, 2019. Golf Canada launches the centralized program (February through May) for the National Junior Squad at its National Training Centre at Bear Mountain Resort in Victoria, B.C. The proposed new World Handicap System is announced, designed to provide all golfers with a consistent measure of playing ability globally. 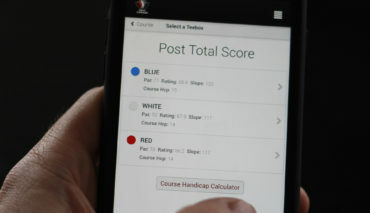 Golf Canada will adopt all features of the new system. Former LPGA Tour player Gail Graham and course architect Arthur Vernon Macan are this year’s inductees into the Canadian Golf Hall of Fame. Golf Canada announce a partnership with the Good Beer Folks at Steam Whistle, Canada’s Premium Pilsner, to become the Official Beer of Golf Canada, the RBC Canadian Open and the CP Women’s Open. 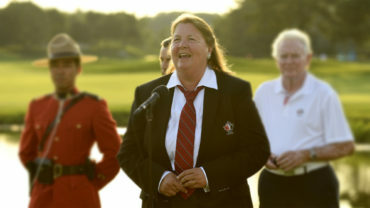 Leslie Dunning of Calgary is elected president of Golf Canada, succeeding Roland Deveau. Tom Zariski of Drumheller, Alta., is named Golf Canada’s 2017 Volunteer of the Year. Golf Canada names four recipients of its Distinguished Service Award—veteran sports columnist Cam Cole alongside former Alberta Golf President Fran Marsden, long-time volunteer Florin “Fuzzy” Bergh of Edmonton, and golf historian Ron Lyons. Canadian Golf Hall of Fame member Lorne Rubenstein, a lifelong golf journalist and author, receives the PGA Lifetime Achievement Award in Journalism.